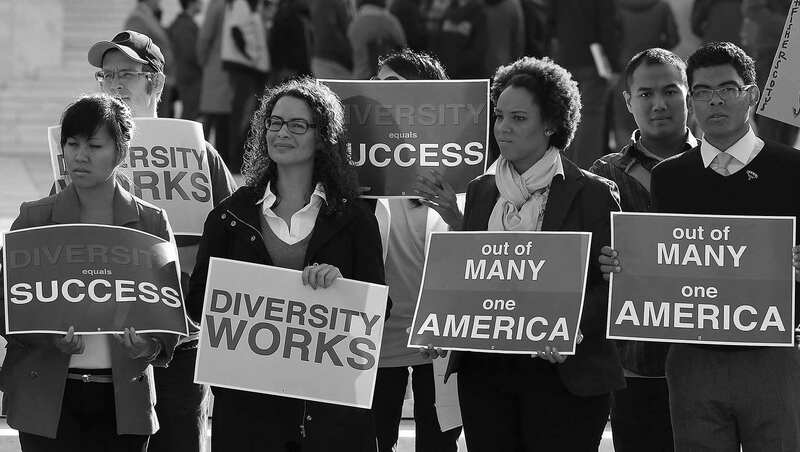 WASHINGTON, D.C. -- At a time of growing dissatisfaction with the way women and minorities are treated in the United States, affirmative action programs -- touted for decades as a way to give both groups a boost -- are gaining favor with the American public. Sixty-five percent now say they favor affirmative action programs for women, up from 60% in 2016. At the same time, 61% favor such programs for minorities, up from 54%. 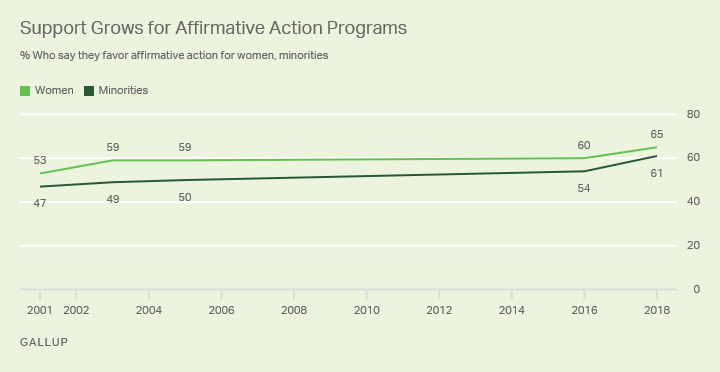 Support for both groups has grown substantially since 2001, when less than half (47%) of the public favored affirmative action programs for minorities, and slightly more than half (53%) favored them for women. Though support has always been higher for women's programs than for minorities' programs, the current four-percentage-point gap between the two is the smallest in the five times they both have been measured. 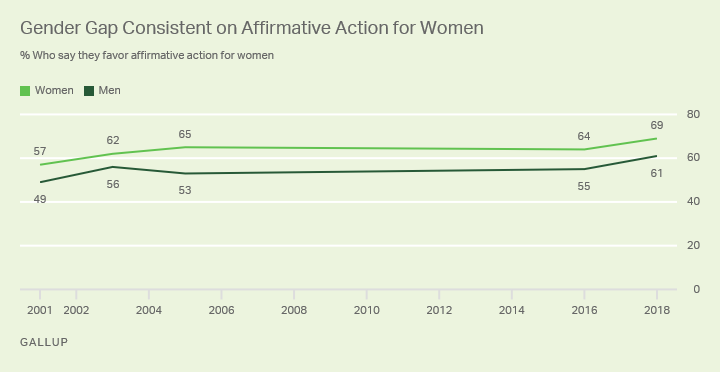 Women have been more likely than men to support affirmative action programs for women each of the five times Gallup has asked the question. The gap between men and women has varied little -- from a high of 12 points in 2005 to a low of six in 2003. Both men (61%) and women (69%) are more favorable toward affirmative action now than in any of the previous polls. The gap between men and women on the issue is nowhere near the largest among demographic groups. Seventy-seven percent of blacks favor affirmative action for women, compared with 61% of non-Hispanic whites. Eighty-two percent of Democrats, but only 46% of Republicans, are in favor. Eighty-three percent of liberals are in favor, compared with 50% of conservatives. There was a large gap in favorability between younger and older Americans in 2016 -- 74% of those between the ages of 18 and 34 favored the programs then, compared with 52% for those 55 and older. But the gap has closed significantly, with 68% of those 18-34 now in favor versus 62% of those 55 or older. The overall increase in support for affirmative action programs for blacks since 2016 is driven primarily by a jump among non-Hispanic whites -- a nine-point gain that resulted in a majority (57%) of whites favoring the programs for the first time. Support among blacks and Hispanics has largely been stable since 2016. The biggest gains in support came from Americans 55 and older. Fewer than half (44%) favored such programs for minorities in 2016, compared with a clear majority of 58% now. Elections across the nation in 2018 have sent record numbers of women to Congress and to state legislatures. The growing power women have attained at the state and federal levels, bolstered by increased public support for affirmative action programs, may be key factors in the battles ahead concerning equal opportunities for men and women in the workplace. A case involving a charge that Harvard University has used affirmative action goals to unfairly discriminate against Asian-Americans is now in the hands of a federal judge. It is possible that appeals could send the case ultimately to the Supreme Court, where the appointment of two new justices by President Donald Trump has affirmative action supporters concerned. The final ruling on the case could conceivably work against a public that, for now, is solidly in favor of the concept of affirmative action for both women and minorities. View complete question responses and trends. Results for this Gallup poll are based on telephone interviews conducted Nov. 19-Dec. 22, 2018, with a random sample of 6,502 adults, aged 18 and older, living in all 50 U.S. states and the District of Columbia. For results based on the total sample of national adults, the margin of sampling error is ±2 percentage points at the 95% confidence level. For results based on the total sample of 4,578 non-Hispanic whites, the margin of sampling error is ±2 percentage points at the 95% confidence level. For results based on the total sample of 701 non-Hispanic blacks, the margin of sampling error is ±5 percentage points at the 95% confidence level. For results based on the total sample of 760 Hispanics, the margin of sampling error is ±5 percentage points at the 95% confidence level. A record-low 46% of U.S. women are satisfied with the way women are treated in society, but 57% are satisfied with the position of women in the U.S.
Americans' satisfaction with the way immigrants, blacks, Hispanics and Asians are treated has fallen in recent years. Although still mostly positive, the percentages of Americans saying blacks are on par with whites in obtaining jobs is the lowest since Dr. Martin Luther King's era. American public opinion on affirmative action in college admissions is complex, with the public supporting the idea in theory, but opposing the use of race and ethnicity as a factor in admissions decisions.